For some time now we had known that the Public Vote victory will be controversial, though it was also very exciting to see how great the enthusiasm around Estadio General Pablo Rojas is in Asunción and beyond. The 8th edition of Stadium of the Year allowed us to meet many fantastic people from around the world and delivered the fascinating results which you can now see in full detail. On our competition page you'll see the number of points, but won't experience the dynamics of the Public Vote. Meanwhile we had spent part of the last 35 days on monitoring social media activity and news releases dedicated to Stadium of the Year. We thus had a first-hand experience of where the competition brings enthusiasm and where people just turn around and carry on with their lives. Despite carrying out only an initial analysis of the press coverage, we already found over 240 articles about Stadium of the Year in over 20 countries, some of them in exotic languages like Persian or Gujarati. The number includes only news of the vote, not of its results. So these articles played a role in encouraging people to vote, for which we are very grateful. After each of them we've seen 1-3 days of votes coming in, even if in different numbers. Take a look at the above map. 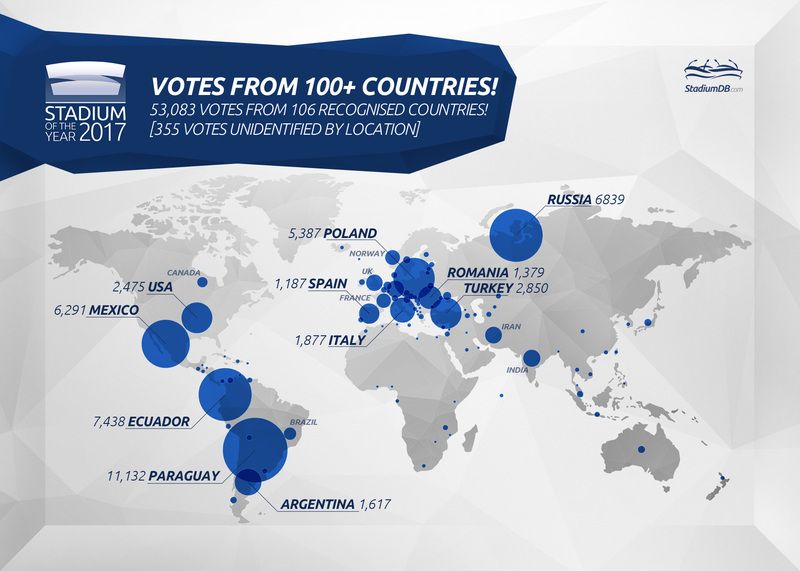 It shows the 106 countries from which votes in this year's competition were case. Of those 106 states, however, only 11 saw participation of over 1,000 people, of course due to having a strong candidate(s). Mainly those, where news circulated in local, regional and national media. The greatest number of publications linking back to our voting page was released in Russia (31), Poland (28), Turkey (24), Mexico and Ecuador (16 each), Romania and Italy (13 each), Paraguay and Spain (10 each). It suggests that online media contribute highly to increased awareness of the vote. No surprise, but worth mentioning. You can't see who didn't vote. 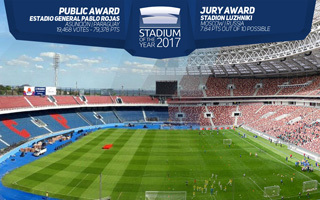 The final results only show the outcome, not those who decided not to vote despite knowing about Stadium of the Year. Which is where we should mention that two great European clubs, Atletico and Zenit, got involved by promoting the vote in their media. And yet the response in votes was moderate at best. We cannot judge why, but issues surrounding both teams' relocation are well documented, which may have dampened the mood around their respective stadia. We've seen a different case in Atlanta, where neither of the franchises playing at Mercedes-Benz Stadium decided to get involved. The same goes for fan groups around them, while some people we were in contact with were outright sceptical about the Georgia stadium. You can't see who didn't have enough 'manpower'. Ironically, one of the most exciting responses to Stadium of the Year came from Frosinone. It's not a major force in Italian football, but this ambitious club has fans who are extremely satisfied with their new stadium. It's modest, compact, but suits them just well. Thus we've seen almost 2,000 votes from Italy, which at one point pushed Stadio Benito Stirpe 10 positions up in the vote. It didn't last and Frosinone became outnumbered, but it's a case worth mentioning nonetheless! There are also other cases of stadiums generating great emotions locally, but without sufficient support in the Public Vote, to name just The Arena by Transstadia and Intility Arena in Oslo. No award for them, but if they had the numbers... it would have been different, because the enthusiasm is there. You can't see what motivated others. After the release of this year's Public Award winner, we've seen some scepticism over La Nueva Olla's victory. As if it only took 11,000 people to grab the award. Well, in a way, precisely, that's what it took! But have you ever tried getting thousands of people to do something? It's no easy task, just ask West Ham United or Atletico – some of the biggest clubs in global football who asked their fans for support in Stadium of the Year just like Cerro Porteńo and didn't really get much. If there's something the Public Award can measure, it's exactly the enthusiasm generated by a stadium, both online and the one in real life. If there's no love for a new stadium in the fanbase, there won't be too much in the vote, too. We've checked it in 8 editions. The more we're pleased to have witnessed what took place in Paraguay in recent weeks and wish the same enthusiasm to all newly opened or rebuilt stadiums!